June 2015 Dr. Hussein Contractor joins us from the UK as an Interventional Cardiology Fellow. May 2015 Dr. Michael Fryer joins us from Brisbane, Australia as an Interventional Cardiology Fellow. May 2014-15 Dr. Bilal Iqbal joined us from UK as an Interventional Cardiology Fellow. December 2014-15 Dr. Jwalant Raval joined us from Australia as an Interventional Cardiology Fellow. Dr. Will Roberts joined us from the UK as an Interventional Cardiology Fellow. September 2013-14 Dr. David Thomson joined us from Australia as an Interventional Cardiology Fellow. Dr. Aengus Murphy and Dr. Cara Hendry joined us from UK., and Dr. Marco Moccetti from Switzerland.as Interventional Cardiology Fellows. July 2012 Dr. W. Peter Klinke, Director of VHIF retires after many years of dedication that has contributed to major advancements of diagnosis and treatment of adult heart disease through cardiovascular clinical research studies. Dr. Jehangir Din joined us from Edinburg, UK as an Interventional Cardiology Fellow. October 2010-11 Dr. Amir Ayyobi joined us from Alberta, Canada to work in the heart cath lab at Royal Jubilee Hospital, as our Cardiololgy Resident. Dr. Alexander Sirker joined us from the UK as an Interventional Cardiology Fellow. Dr. Imad Nadra joined us from Hazelmere, UK as an Interventional Cardiology Fellow. December 2009 Dr. J. David Hilton, Co-Director of VHIF has retired after many years of commitment to making VHIF a major clinical trial center noted for excellence in phase 2 and 3 cardiovascular clinical research studies. Dr. Nicholas Cruden joined us from Edinburgh, UK as an Interventional Cardiology Fellow. September 2008-09 Dr. Bethan Freestone joined us from Birmingham, UK as an Interventional Cardiology Fellow. Dr. Tycho Vuurmans joined us from Holland as an Interventional Cardiolofy Fellow. October 2007-08 Dr. Simon Robinson joined us from Belfast, Ireland as an Interventional Cardiology Fellow. April 2007-08 Dr. Laurent Haegeli joined us from Basel, Switzerland as an Interventional Cardiolofy Fellow. VHIF wishes to recognize the contribution and express appreciation to the Victoria Foundation for their support of cardiovascular research in Victoria. Victoria Foundation recently provided a grant to support both a gene-therapy research trial, and an original research project designed to evaluate the safety and efficacy of same-day discharge for selected heart patients undergoing radial approach percutaneous coronary interventions. Dr. Andrew Small, VHIF Cardiovascular Fellow, is leading the same-day discharge research project. Our VHIF Interventional Cardiology Fellows are featured on a local news program. This clip showcases the cutting edge techniques (radial approach) that the Fellows train in at the Heart Cath Lab, Royal Jubilee Hospital, in Victoria, BC, as part of the VHIF Fellowship program. Dr. Mark Spence joined us from Belfast, Ireland as an Interventional Cardiology Fellow. Dr. Jon Byrne joined us from London, England as an Interventional Cardiology Fellow. Noreen Lounsbury and Lynn Mitchell, VHIF Clinical Research Nurses have been honored with Recognition Awards from the College of Registered Nurses of British Columbia for "Valuable Contribution to the Nursing Profession". Dr. Andrew Small joined us from Queensland, Australia as an Interventional Cardiology Fellow. Dr. Alexander Chase joined us from Bristol, U.K. as an Interventional Cardiology Fellow. SNAPIST-III is a research trial for patients attending the Royal Jubilee Hospital's Heart Cath Lab for coronary angioplasty and stent implantation. This trial will evaluate the effectiveness of paclitaxel (ABI-007) for the prevention of in-stent re-stenosis. 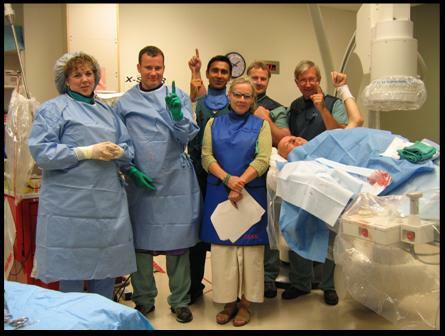 An international study with the first patient enrolled from Victoria, B.C.! Our good patient! Mr. R.
In response to a series of newspaper articles that appeared in newspapers across Canada, VHIF responded with an Editorial which ran in the Victoria Times-Colonist. "Yesterday's research is tomorrow's best practice... Today's research leads to tomorrow's breakthroughs."